Prior to his EMS career, Jeff was a youth pastor. Jeff was very passionate about his job, and had never thought about a career in EMS. It was not until Jeff’s own family had to call upon an EMS services to administer aid to his sick grandmother that he considered joining the profession. Jeff was impressed by the knowledge and compassion the first responders provided, sparking his interest. 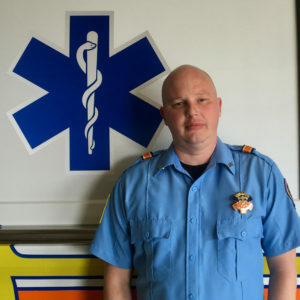 Jeff became an EMT Basic, and then quickly entered Paramedic school where he earned his Associates Degree in Paramedicine. Jeff is currently working toward his Bachelors degree in Paramedicine, and one day hopes to continue his career on the ocean as a cruise ship Paramedic. Jeff is a model employee and continues to grow his knowledge in our ever-changing industry. Jeff’s compassion for his patients is evident on every call. Jeff is always willing to do whatever it takes to provide the best care possible, and treats each patient like he would treat family. Jeff is the definition of dependable and he is the first to assist on a call, even if he is off duty. Jeff is well respected in the community and among his colleagues. Jeff is the top preceptor for the local paramedic program, and enjoys sharing his knowledge and skills with students. Any company would be proud to be represented by Jeff Russell. Jeff’s respectfulness, promptness, and professionalism are what make him a Pafford Medical Services Employee of the Year and a true Star of Life.